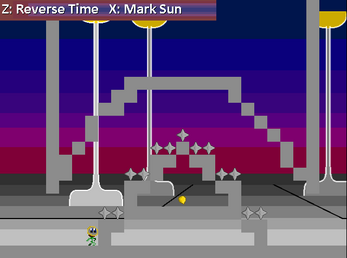 X - Place a seed to jump on, or mark the sun to boost when passing through it's rays. This game is best-optimized to be played on Chrome due to its engine, CraftyJS. Audio was made with Bosca Ceoil and BFXR. This game is an autorunner where pressing Z will "reverse time", or send you backwards. 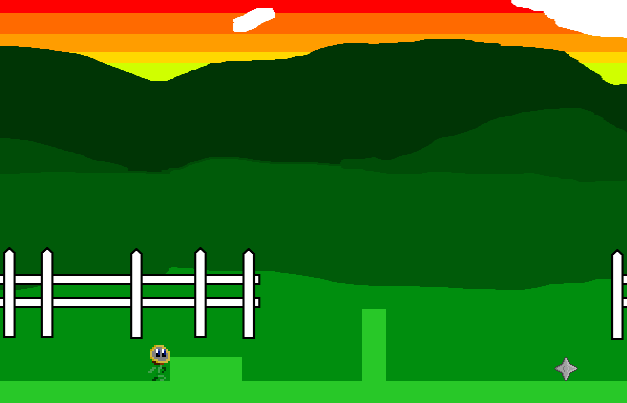 When going back in time you do not collide with anything but the floor and can retreat to a safe position if you fall into a pit of spikes (for example). 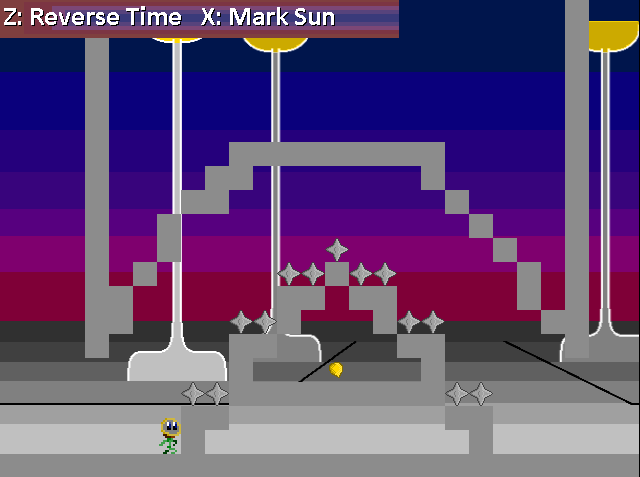 When going forward in time, pressing X will place a mark for the next time you time travel to focus the sun on that position. When you then hit that focused sun (when going forward in time), you'll be boosted forward. When going backward in time, pressing X will place a seed. This seed, the next time you time travel, will grow into a plant which will bounce you if you run into it. Going back in time drops your momentum entirely and gives you a default speed. You only trigger new jump-plants and new sun-rays to spawn when switching from reverse-time to forward-time. You can only interact with jump-plants and sun-rays when going forward in time. Hitting obstacles sets your speed to zero, but only during forward time. If you try really hard you can make yourself move really slow by timing boosts / hitting spikes. Reset this by walking into a spike. Replaying the game causes the audio to break. 10:00 PM Dec. 13: Fixed bug preventing ending from being reached. 2:00 AM Dec. 14: Fixed that same bug but for real this time. 11:00 PM Dec. 28: Fixed bug with piston positioning that would occasionally render game unfinishable.